Earlier this week I posted my review of Baum’s first and most famous Oz novel, The Wonderful Wizard of Oz. Now let’s take a look at some of the adaptations/re-interpretations of that original Oz book. There were several Broadway and stage plays of the Wizard of Oz especially in the nearly 40 years between the release of the novel and the production of the MGM movie. Baum originally had no intention of writing an Oz sequel but he did produce a stage play of the novel. The popularity of one of these stage plays directly led to Baum writing the first Oz sequel. The Wizard of Oz (1939) – The original MGM musical. At this point, this movie is probably more well known than the books. I watched it on Blu-Ray right after I finished the book. I love this movie so much. It’s just amazing. Every time I watch it I love it more. I think I’ve mentioned that I own the soundtrack and you should know I’ve been listening to it all week. 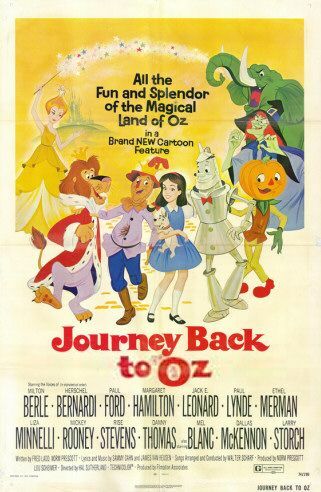 Journey Back to Oz (1974) – Animated movie that is the “official” sequel to the 1939 MGM movie. Not really based on any of the other Oz books. The producers really went all out. Dorothy is voiced by Judy Garland’s daughter, Liza Minelli. Margaret Hamilton who played the Wicked Witch in the 1939 movie voiced Aunt Em in this sequel. The audio track for this movie was recorded in 1964. It took 10 years for the producers to raise enough money to complete the animation which was done in 1974. This is the first time I remember seeing the character Jack Pumpkinhead who actually shows up in Baum’s later books. 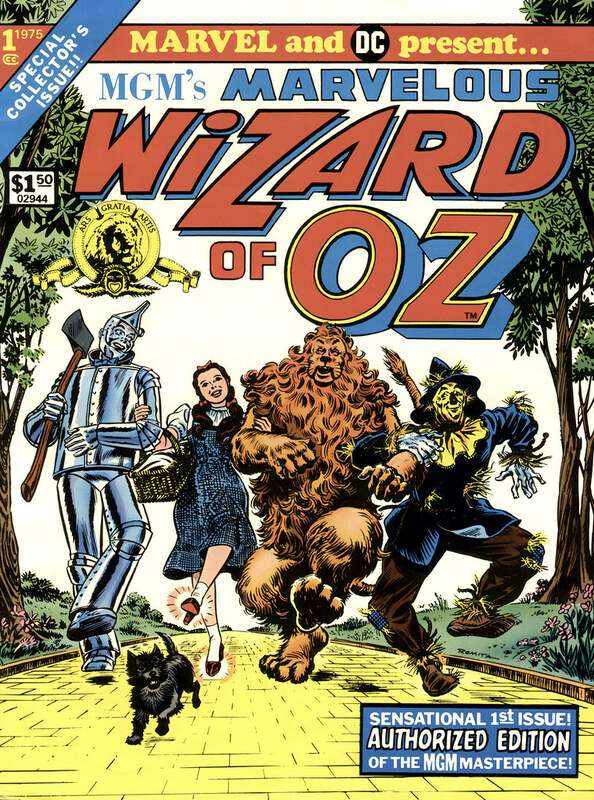 MGM’s Marvelous Wizard of Oz (1975) – The first comic collaboration between Marvel and DC. Written by Roy Thomas and drawn by John Buscema and Tony DeZuniga. It’s a straight adaptation of the MGM movie. Nothing more, nothing less. Great art, though. Marvel continued this series with one more issue which you’ll see in my next installment. 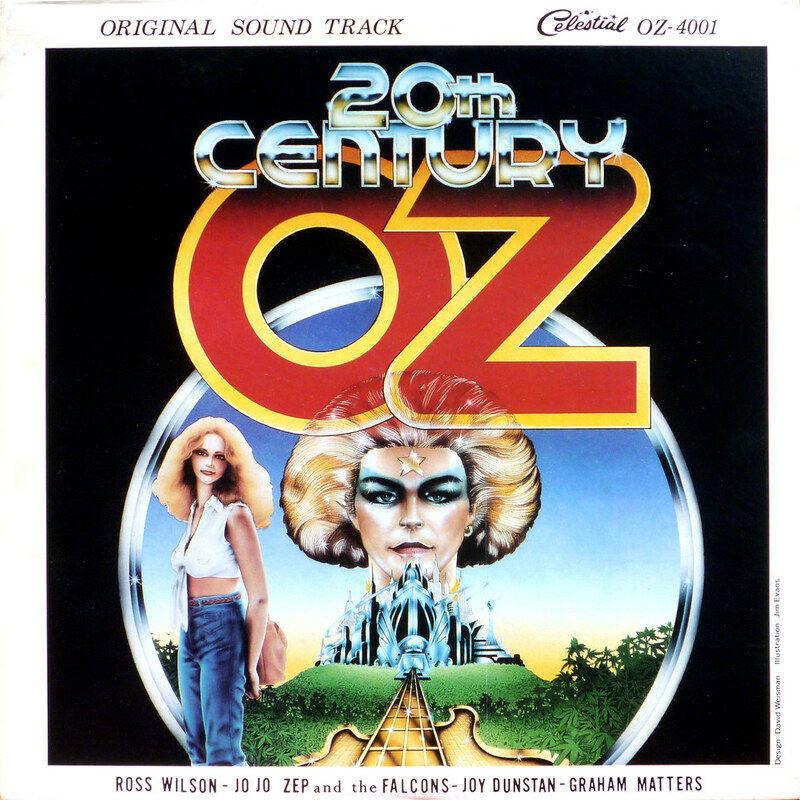 20th Century Oz (1976) – An Australian “rock-n-roll” adaptation of the Wizard of Oz. Dorothy is a rock groupie. It sounds terrible and I have NO desire to watch it. The Wiz (1978) – An urban retelling of The Wizard of Oz starring Diana Ross, Michael Jackson, Nipsey Russell and Nell Carter. It’s actually pretty good. Again, I love the soundtrack. Marvel Illustrated’s The Wonderful Wizard of Oz (2009) – Straight up adaptation of the original novel. Adapted by Eric Shanower with awesome artwork by Skottie Young. Young really captures the environment of Oz with his art. I really, really liked this. Marvel also did the next two Oz sequels. The Muppets Wizard of Oz (2005) – Watched this the other night. Ugh. I don’t mind the non-Henson Muppet movies (Muppet Christmas Carol, Muppet Treasure Island, Muppets from Space) but this movie is terrible. I couldn’t finish it. Just so awful. The guy that did Mrs Piggy and Fozzie didn’t change his voice for either character. Fozzie sounded exactly like Piggy. WTF?! At the very least, Ashanti is a hottie. But this movie had good intentions and I liked some of their ideas, but it’s just not good. The Undead World of Oz (2009) – A re-adaptation of Baum’s original Oz novel but includes a new subplot involving zombies a la Pride & Prejudice & Zombies. The idea is a little overplayed but I really want to read this. I may grab the digital version on my Nook. I wonder if they modify Denslow’s illustrations to include zombies? This sounds better and better the more I think about it. This entry was posted on February 24, 2012 at 8:00 am and is filed under books, movies, pop culture, Wizard of Oz with tags books, comic books, movies, Oz books readthru, pop culture, Wizard of Oz. You can follow any responses to this entry through the RSS 2.0 feed. You can skip to the end and leave a response. Pinging is currently not allowed. You tease. I can only imagine, you, sitting smugly at your computer while we, your poor readers, are left pondering what the hell could possibly be in this film. If Dorothy’s a groupie, what are the rest of them doing? Yeah, that Muppets Wizard of Oz adaptation was brutal and what set me on the path to giving up on the Muppets all together. Thankfully the recent movie redeemed them. Never seen that. Mind = BLOWN. Have you read Wicked? I’d love to hear your thoughts on it. Yes, I read it back in early 2000-2001. I found it at a bookstore in LA when I was on project there. It was well written, but I didn’t really like it. I thought the concept was good but that the author didn’t expand it to its potential. It was just so-so for me. You’re right, Kathy, I really should have included that in this article. I thought, yes, the concept is good and the book is well written, but it was not what I was expecting. When I read the book it was still 2 or 3 years before the broadway play, but the broadway play was exactly what I was expecting out of this book. Instead I get this really deep multi level political drama. Not what I was expecting nor what I wanted.